(Newser) – The world received a rude awakening this week regarding Europe's migrant crisis; now an Egyptian billionaire hopes to help out in a big way: He wants to buy an island to be filled with hundreds of thousands of migrants and refugees. 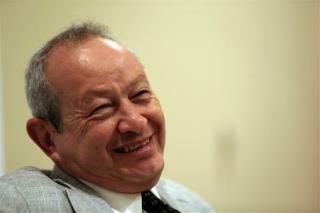 "Greece or Italy sell me an island, I'll call its (sic) independence and host the migrants and provide jobs for them building their new country," business mogul Naguib Sawiris wrote on Twitter on Tuesday. Elaborating, he tells the AFP it's a "feasible" plan. "You have dozens of islands which are deserted and could accommodate hundreds of thousands of refugees," he says, adding he plans to broach the subject with the governments of Greece and Italy. Why doesn't he invite them to Egypt and do the same thing. Look at how well they've improved their living conditions back in the countries they came from and then tell me how nice a country and infrastructure they can build once planted elsewhere. Libertarians ...sheesh. They really live in the real world.